Good news. The eagerly awaited version 3 of FileMaker 8 was released today. 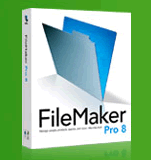 It is available as a free 12 mb download from FIleMaker’s Downloads page. The update works on FileMaker Pro 8 v2. If you haven’t updated to v2, you’ll need to use the FileMaker Pro 8 v2 updater first and then run the v3 updater. This updater will update both FileMaker Pro and FileMaker Pro Advanced. I installed the updater and it installed without difficulty. It did take about 4 minutes or so on my G4 Powerbook though. This entry was posted in FileMaker News on April 25, 2006 by janet.